How do those who believe man is tripartite respond to Gen. 2:7, “the man became a living soul”? How do those who believe that man is tripartite answer the objection (from those who believe that man is bipartite) that a man is a living soul and therefore does not have a soul, based on Gen. 2:7? 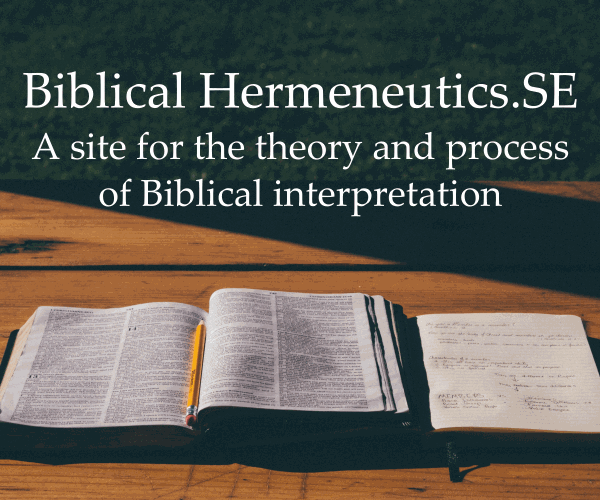 This question came from our site for professors, theologians, and those interested in exegetical analysis of biblical texts. Gen. 2:7, which states that "the man became a living soul" (thereby implying that "the man" = "the living soul"), seems to conflict with 1 Thes. 5:23 which states that man is composed of "the spirit and the soul and the body" (τὸ πνεῦμα καὶ ἡ ψυχὴ καὶ τὸ σῶμα). Is man a soul or does man have a soul? The apparent contradiction can be reconciled if we understand that the author of Gen. 2:7 is using the Hebrew word נפש (Greek ψυχή) as a synecdoche of part for the entire person. Hence, נפש is used to represent the entire man because it represents one of the more important parts of man. I am not a Christian. Therefore, I will not comment on the Christian scriptures. The term "Context" is often used ambiguously regardless that more than one "context" is actually viable to a passage. One cannot and should not use the term "context" without proving that "context" is the actual "context" in the first place. Therefore we cannot use the word "context" to say when the word [נפש] nefesh has one meaning, and then another or another. As far as the Hebrew is concerned all occurrences of [נפש] mean the same. [נפש] nefesh and its Arabic counterpart "nefes" = breathe, breath. That is the literal meaning. Soul is an idiomatic, anecdotal and inconsistent reference to the word "nefesh". Like emotion is the inconsistent reference to the idiomatic meaning of heart. 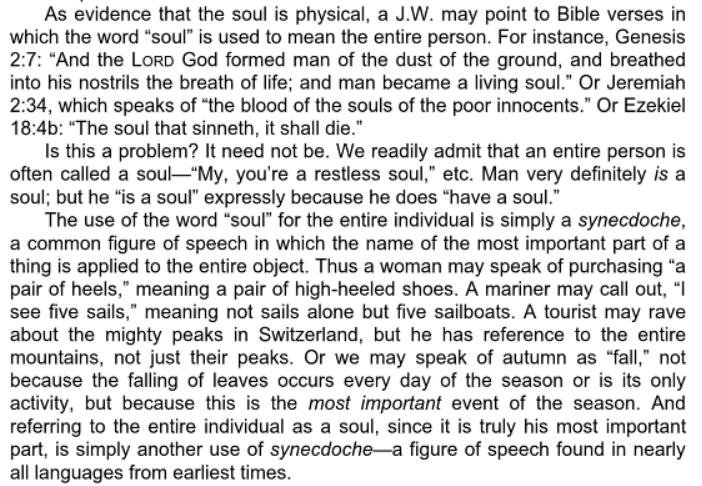 BTW, while in Christian Bible school, I learnt that the Koine Greek word translated into English word as "soul" is the same word for psyche - πσυχη = the mind. Most assertively, the KJV or NIV (and their ilk) are the worst possible sources of understanding the actual meaning of the word nefesh. Therefore, you cannot depend on, or should even dare to quote from those English translations because they have masked out the actual occurrences of nefesh. IMO, the theology of the human trinity is non-biblical but is like Isaac Newton's unscientific assertion that the rainbow has 7 colours. Today, we know that the rainbow has a continuum of colours. We also know that there are not three primary colours, but there are three primary modes of stimulation to colours in our eyes. However, many misguided religious people have a need to correlate non-biblical concepts to a biblical special number, to elevate the status of their theory. Therefore, with the following evidence (that demands a verdict), the question is akin to asking, "Do animals have a psyche, do they breathe?" Does psyche actually equate to breath? Maybe, it does because in some cultures when they say "my liver bleeds for you", we know they mean the same thing as when we say "my heart longs for you". Gen 1:30 also applies the term "nefesh" on non-human animals. will I inquire of the nefesh of the human. There too many occurrences of nefesh in the Hebrew of the Bible. "Soul" is an anglo-saxon word for which translators have picked and chosen inconsistently when to use to translate from nefesh. I would say, it is close to being pagan. When reading the Bible, one should cleanse one's mind of all pagan or hellenistic predispositions. Are there 10 commandments, 11 commandments or 12, or 613 ?? When I was little, my sister asked me to count the number of commandments in the book of Leviticus vs Deuteronomy - my count came out to more than 1000. In Statistics of component analysis, grouping and classification methods, we can dimensionify a spectrum of a field into more than 100, to 14 or down to 5, depending on the basis we use for each observation. Is your basis consistent? Who gives you the right to define nefesh one way, and then another, to your whims and fancies? Why should I depend on anecdotal opinions of "theologians" that have no biblical basis? Maybe, the human is a continuum between flesh and spirit. There is no distinct boundary, and nefesh is merely a segment within the spread of the spectrum of a human's existence. Did the Bible say that - no. Did the Bible refute that - no. Is the spine part of the human mind? Why not? Physiologically, our attitudes are influenced by the synapses experienced thro the spine. Is the heart part of the human psyche? Is muscular memory part of my psyche? Are the nerves? The theology of the human soul is an unnecessary, and often inaccurate, endeavour towards our ultimate quest of having a relationship with our Creator. The confusion from trying to understand the tripartite person stems from the fact that the human mind is not geared to comprehend the difference between the Spiritual realm and the physical realm. Our minds are geared to comprehend real as things that stimulate the five senses. We only accept as true those things which we can see, hear, touch, taste, and smell. In actuality the material realm is not the true essence. It is preliminary to Christianity to believe that God created all material things. What is the truth in believing in the supremacy of God is that the Spiritual realm is preexistent to the Material realm. So what does that statement actually mean? If we are to believe that God is Supreme then we have to accept the first chapter of Genesis. That necessitates that we believe that God, Heaven, The Angels, Satan, and etc. are all of the Spiritual realm. That is to say that they preexisted Chapter one of Genesis. We must also accept that God is the supreme being in the Spiritual realm. By accepting Chapter one of Genesis, we are in reality accepting that the material realm has a beginning; while the Spiritual realm is eternal. So let's take a look at what transpires in Chapter one of Genesis; and we are doing so in the belief that we accept Genesis as fact. Genesis 1:26 KJV And God said, Let us make man in our image, after our likeness: and let them have dominion over the fish of the sea, and over the fowl of the air, and over the cattle, and over all the earth, and over every creeping thing that creepeth upon the earth. Let us dissect that verse in the concept of a tripartite God. God in this case consists of three persons in one identity. The God head consists of the father, the son and the Holy Ghost. This is basic to my understanding of the Southern Baptist belief, which is un-arguably based on a tripartite God. Genesis 2:7 KJV And the LORD God formed man of the dust of the ground, and breathed into his nostrils the breath of life; and man became a living soul. So let's take a look at what that actually says. And the LORD God formed man of the dust of the ground, this actually says that God took a part of his original creation and reformed it into a man, however; at this point it is nothing more than a lump which God has given a material form. and breathed into his nostrils the breath of life, Here something different has happened. God has now put into this creation something eternal that being the breath of life. Why this is significant is because this is something that is a part of God and we must remember that God in all of his manifestations is Eternal, therefore the breath of life which he breathed into man is also eternal, and as a result part of the man he created is now eternal, and brings about the final part of this Scripture which says that man became a living soul. So now what do we have, we have the original lump which we call man, We also have the breath of life which is a part of God and therefore eternal, and lastly we have now residing in this lump that God created something that will be eternal. And so we have now something eternal existing within something material. Or you might say that we have a bipartite creation part of the Spiritual realm paired with something from the Material realm. Even though this is a bipartite being (spiritual and material) it is also tripartite in that it contains two parts Spiritual (breath and eternal existence [also known as soul]) along with one part material. The body is only a repository for the eternal soul and spirit. The difference between spirit and soul lies in the same as the difference between knowledge and experience. Experience is the application of knowledge, the soul is the application of spirit (spirit in this case refers to the motivations a person employs), and is the basis for judgment. Not the answer you're looking for? Browse other questions tagged genesis nature-of-man tripartite or ask your own question. What is the biblical basis for the immortality of the soul? What is the essential argument in favor of the tripartite nature of man? What is the biblical basis for the Dual Nature of Man as opposed to the Tripartite Nature? How do proponents of the dual nature of man address Hebrews 4:12, “dividing soul and spirit”? When was the tripartite (body, soul, and spirit) view of man officially rejected by a church council?